" Serving You On The Web Since 1997 "
Shipping: We can combine shipping on large orders to reduce costs. Style: 3375 - As Low as $8.65 a pair! 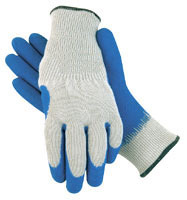 These are the same Gloves that Sam's Club® carried under the Wolverine® Brand years ago! Genuine pigskin leather palm, reinforced pigskin palm patch, cotton back, wing thumb, Gunn cut, leather index finger, fingertips, and knuckle strap, safety cuff and gathered elastic at wrist. Excellent for working with equipment, fencing, farming, ranching or garden work. $2.25 Shipping for each additional set Style: 610 - As Low as $7.24 a pair! Smooth grain cowhide, keystone thumb, Gunn cut, taped cuff, shirred elastic at wrist. Used by Professional Drivers, Electricians, Plumbers and others. US $21.72 / 3 pair + $5.25 S & H Style: 66 - As Low as $2.24 a pair! 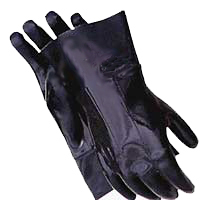 Knit glove with a textured rubber latex coating on the palm and fingertips. Knit wrist cuff to keep the dirt out. Use for long handle tools, handling slippery surfaces, glass and wet materials. Style: 287 - As Low as $8.89 a pair! 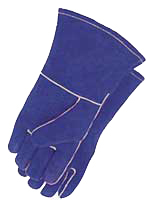 Bright blue suede cowhide Welding Glove sewn with Kevlar® fireproof thread, wing thumb, 12-inch gauntlet cuff, and full 100% cotton lining. Better quality than most welding gloves on the market today. US $26.67 / 3 pair + $5.95 S & H Style: 7798 - As Low as $2.94 a pair! 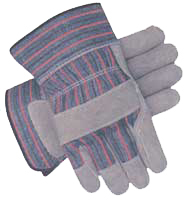 Men's full 100% - 10 1/2oz Cotton Brown Jersey glove with straight thumb, Clute cut for comfortable fit and knit cuff. Compare to others that are only 9 oz! This glove is used by ropers to keep from getting rope burned. Also used by State Licensed Pesticide Applicators for installing Coyote Cyanide traps. US $35.28 / 12 pair + $9.95 S & H Style: 7731 - As Low as $2.78 a pair! 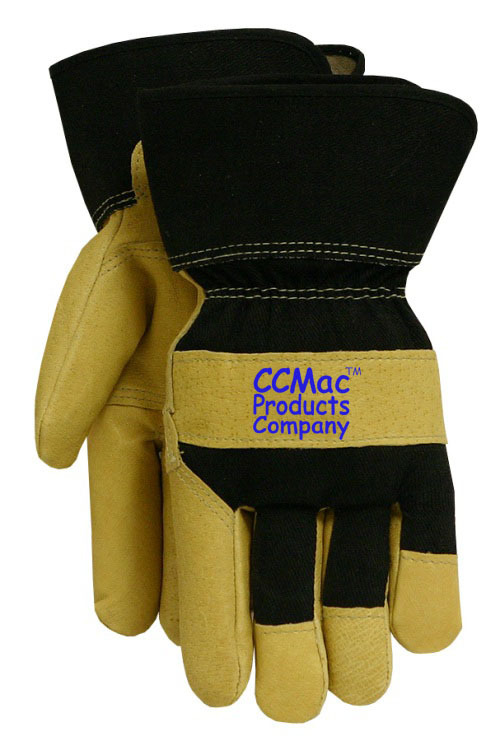 Lightweight suede cowhide, striped cotton back, wing thumb, gunn cut, leather index finger, fingertips and knuckle strap, safety cuff and shirred elastic strap for a snug fit. Style: 771 - As Low as $4.63 a pair! 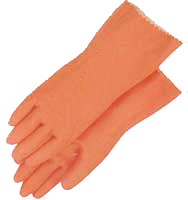 Medium duty unsupported Nitrile, flock lined, 13" gauntlet cuff. Resists many yard, garden and farm chemicals including ammonia, caustics, fertilizers and herbicides. Used by Professional Pesticide Applicators and others that need protection from many harmful or caustic chemicals. US $13.89 / 3 pair + $6.95 S & H Style: 775 - As Low as $2.79 a pair! 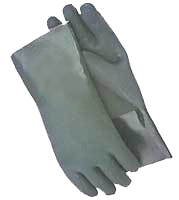 Medium duty unsupported 100% rubber latex glove with 100% cotton flock lining and 12" gauntlet cuff for extra protection. US $33.48 / 12 pair + $5.95 S & H Style: 775 - As Low as $3.79 a pair! Heavy duty unsupported natural rubber latex, flock lined glove with 12" gauntlet cuff and pebble palm for safe grip. Resist many refinishing chemicals such as paint and varnish removers, thinners, turpentine, mineral spirits, stains, shellacs, varnish and polyurethane. Style: 4414T - As Low as $4.98 a pair! For use with Liquid & Dry Chemicals. PVC vinyl coated, 100% cotton jersey lined, 14" gauntlet, wing thumb, rough finish for wet grip. 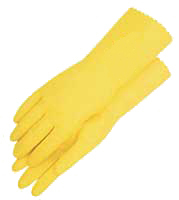 Resists abrasion, oil, acid and agriculture related chemicals and solvents. For Farm, Home and Industrial Chemical use. US $14.94 / 3 pair + $6.95 S & H Style: 6780 - As Low as $8.95 a pair! For use with Liquid & Dry Chemicals. 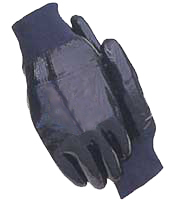 Neoprene coated, interlock cotton lined, set-in wing thumb with 12" gauntlet cuff. Protects against cuts, abrasions, oil, sunlight, greases, chemicals, acids and caustics. For Farm, Home and Industrial Chemical use. US $26.85 / 3 pair + $6.95 S & H Style: 5122 - As Low as $7.49 a pair! Neoprene coated, cotton interlocking lining, wing thumb with knit cuff. Protects against cuts, abrasions, oil, sunlight, greases, chemicals, acids and caustics. For Farm, Home and Industrial Chemical use. Although every survey shows that consumers rank “CUSTOMER SERVICE” as their #1 priority, We All Know it is “Declining…And At An Alarming Rate”. In these uncertain times, companies should treat Each & Every Customer as being Individually Important & Extremely Valuable. BUT, I DON'T THINK THEY DO! DO YOU? We At CCMacTM have Always treated our customers as we would our friends, with them being Important & Valuable. And, We Consider it to be Vital to our Future Success! But that said...Even We Know that Customers are Still Very Easily Lost "Through Poor Customer Service"! To Not Ever Let That Happen, But To Provide “Exceptional Customer Service" To Every "Actual" or "Potential" Customer”, Offering QUALITY, VALUE, and SERVICE on every one of our “Difficult to Find Products”. THAT’S OUR PROMISE TO YOU … AND WE STAND BEHIND IT! Most of our products are available Wholesale to Qualified Buyers. Please ask if interested. "Since 2002" "Our Site is"
© Copyright 1997 - 2011 CCMacTM. All Rights Reserved. LEGAL NOTICE: This Website, All it's Pages, Code and Images (except those designated as being owned or belonging to other organizations) are Copyrighted by CCMacTM, which Retains and Reserves All Rights to them. Exceptions to the CCMacTM Policy, if written (hereafter called "The Document"), are only legal when made: 1.) By written permission through the use of a Hard Copy Document and, 2.) The Document MUST be On CCMacTM Letterhead and, 3.) The Document MUST be Signed by an Officer of the CCMacTM Company and, 4.) The Document MUST spell out the specifications of the EXACT allowances to the Policy being agreed upon by CCMacTM, and 5.) The Exceptions MUST be ALL listed in the aforementioned Document. No Actual or Implied exceptions are considered Legal unless they are specified in The Document as giving such Right of The Policy Exception to another Party. Under NO circumstances will verbal, email, Fax, phone or ANY other form of communication specifying exceptions to this expressed policy, be considered Legal. Violators of the CCMacTM Policy will be prosecuted to the fullest extent of the Copyright laws available. All forms of HTML and associated code and Images used by CCMacTM have numerous documented hard and soft copy renditions, starting in 1996, that will establish beyond any doubt our Rights and Copyrights to this material. IN OTHER WORDS, UNLESS YOU HAVE OUR WRITTEN PERMISSION, DON'T COPY OUR HTML, CODE OR IMAGES UNDER PENALTY OF LAW! Telephone Consumer Protection Act: Pursuant to the the Telephone Consumer Protection Act (TCPA), current FCC rules and the Junk Fax Prevention Act, passed by Congress in 2005, NO UNSOLICITED advertisement to any of CCMacTM number's, including FAX numbers, are desired or will be accepted. Violations of this Act will not only be reported to TCPA & the FCC, But WILL be prosecuted to the FULLEST extent of the law that we can. Exception to TCPA: CCMacTM will make the following Exceptions to the TCPA Regulation; Faxes and Communications Directly relating to our PRODUCT LINE (this being defined By Us as being representative of any of the current Products CCMacTM carries, or Products that would be complimentary to the CCMacTM Product line, AND FROM A MANUFACTURER DEALING IN VOLUME, will be accepted as being desirable. This is unless we advise you, by the process you are required to have in place by the TCPA and FCC, to be removed from such future advertisements. If you are so advised (using your process to be removed from your contact list), one additional violation will be accepted as maybe missing the removal requirement. After that, any additional violations will be reported to TCPA & the FCC, AND WILL be prosecuted to the FULLEST extent of the law.